Our sell-out cookbook is now back in stock! Just for One or Two is one of the fastest selling cookbooks we have ever published. Selling out well before Christmas, it proved to be a real favourite with our customers. After many requests we have reprinted, and it’s now back in stock and available to order online here <link> or by calling 01425 463390.
escape for a meal out. So why not make every day delicious with Just for One or Two? A very special (but super-easy) Valentine’s Day menu. For romantics out there here’s a gorgeous menu of recipes from the book to cook for (or with) your other half on Valentine’s Day. And don’t forget to look out for our competition to win a fabulous Breville Crêpe Maker. Coming very soon. Preheat the oven to 200°C/400°F/Gas 6. Remove the stalks from the mushrooms. Chop the stalks finely and then mix with the shallots, breadcrumbs, melted butter, thyme and seasoning. Pack the mixture into the mushrooms. Place on a baking sheet and cook in the centre of the oven for 15 minutes. Place the cheese on the mushrooms and sprinkle with a few extra thyme leaves. Return to the oven for a further 10–15 minutes, or until the cheese starts to melt and turn golden. Remove from the oven, sprinkle with black pepper and serve immediately with a few salad leaves if liked. Mushrooms don’t need peeling; just wipe with a clean, damp cloth or small mushroom brush to remove any dirt. 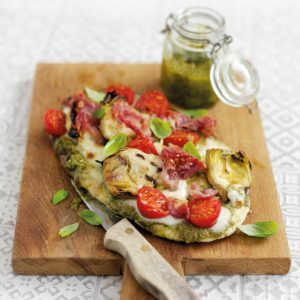 This recipe is ideal fo using up any leftover cheese; instead of goat’s cheese use any sliced soft cheese or grated hard cheese of your choice. You could use a pinch of dried thyme instead of fresh. You could also add a little lemon zest to the stuffing mixture if you like. Preheat the oven to 200°C/400°F/Gas 6. Pour 2 tablespoons oil into a roasting tin and place in the oven to heat up. Meanwhile, put the potatoes in a pan of water, bring to the boil and simmer for 2 minutes. Drain well and rough up the edges by shaking in the pan. Remove the roasting tin from the oven and carefully add the wedges. Season with salt and pepper. Using a long handled spoon, coat the potato wedges in the oil and spread out in the tin. Return the tin to the oven and cook for 45–50 minutes until crisp, turning after 20 minutes. To make the sauce, heat 2 teaspoons oil in a small heavy-based frying pan over a medium heat. Add the onion and garlic and cook for about 5 minutes until softened, stirring frequently. Add the peppercorns and 4 tablespoons of the beef stock. Simmer until almost all the liquid has evaporated, then add the leftover stock with the cream and bring to the boil. Simmer until reduced and thickened, stirring occasionally. Season to taste. For the steaks, preheat a griddle until hot. Brush 1 teaspoon oil onto both sides of the steaks, then cook according to taste. Usually, for rare cook for 2 minutes on each side, for medium cook for 3–4 minutes on each side, and for well done cook for 4–6 minutes on each side. Leave to rest for a few minutes. Serve the steaks with the potato wedges, salad and the peppercorn sauce. Put the flour, sugar and egg into a bowl and mix. Then mix the milk with 60ml (2fl oz) of water in a jug and gradually whisk it into the sweetened flour and egg, together with 2 tablespoons oil, to make a smooth batter. Put the marmalade in a small saucepan with the brandy. Bring to the boil, stirring, until the marmalade melts, then boil for a few minutes to make a syrup. Remove the pan from the heat and leave to stand. Pour a little oil into the base of a small non-stick frying pan. When hot, pour away the excess oil. Add 2 tablespoons of the crêpe mixture to the pan and tilt the pan until the base is covered. Cook for 1–2 minutes until the base is lightly browned. Turn the crêpe over with a knife and cook the other side. Slide it from the pan and keep warm. Repeat until all the batter has been used. Arrange the crêpes on warmed plates and spoon the marmalade sauce over them. Serve immediately. If you don’t have brandy, simply add 2 tbsp water instead. You could serve the crêpes with a scoop of vanilla ice cream if you like. The whole point of Valentine’s Day is to enjoy time with your other half. So if you choose to eat at home rather than visit a restaurant (who may well inflate their prices for the privilege of dining with them on February 14th! ), you will want a menu that gives you maximum time together rather than hours slaving in the kitchen. that you can enjoy each other’s company. This speedy salad takes only 5 minutes to prepare yet tastes divine. The mix of textures and the contrast between the sweet pears and the salty Stilton works beautifully. 1 Put the prepared salad and chicory leaves in a bowl. Add the pears to the bowl with the Stilton followed by the walnut pieces. Drizzle with the oil and lime juice, mix gently and season with salt and pepper. 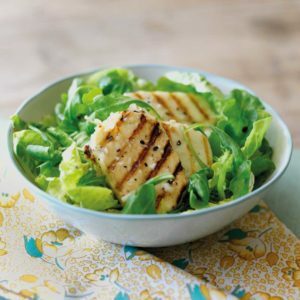 2 Arrange the salad neatly in the centre of two large plates and serve at once with a warmed par-baked roll per person. Cod loin is a really meaty fish, which works brilliantly with Pancetta. The veg is cooked in the oven with it, so all you need to do is heat a pre-prepared packet of rice or mixed grains and your whole meal is done. 1 Preheat the oven to 200°C/400°F/Gas 6. Generously wrap the cod loins in pancetta. Drizzle a little oil in a roasting tin and pop the cod loins on top of the oil. Drizzle the loins with a little more oil, season with pepper and roast in the oven for 10 minutes. 2 Meanwhile, tip the remaining oil into a plastic food bag. Add the asparagus tips and season with salt and pepper. Shake gently so the asparagus is lightly coated in oil. 3 Remove the cod loins from the oven, baste the pancetta with the juices in the pan and add the asparagus spears, making sure they are in a single layer. Roast for a further 8–10 minutes until the cod loins are cooked through and the asparagus is tender. 4 Heat the mixed grains (if using) in the microwave according to the packet’s instructions. Flavour the mayonnaise with lime juice, adding it gradually so it doesn’t split the mayonnaise, and season with salt and pepper to taste. 5 To serve, set a spoonful of mixed grains on each plate, pop the cod loin on top and arrange the asparagus spears neatly to the side. Serve at once with the lime mayonnaise. 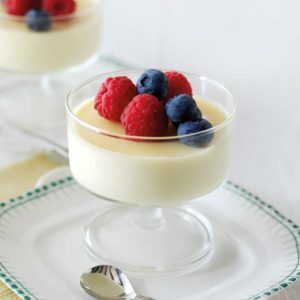 Make ahead and chill until you’re ready to pop it into the oven and then take time to saviour this decadent treat, served warm with a good drizzle of ready-made custard. 1 Preheat the oven to 190°C/375°F/Gas 5 and lightly butter a 600ml (1 pint) pie dish. 2 Spread the bread with butter and then with the marmalade and then cut each slice of bread into four triangles. Arrange the triangles in the prepared dish, sprinkling the layers with sugar and sultanas. 3 Beat the eggs and milk together in a jug, then pour into the dish. Bake in the oven for about 30 minutes until golden brown and set. Serve warm. Recipe taken from Fantastic Food For Less cookbook. Read blog on the Dairy Diary website.